The creak of old wooden floors. The sliding of beautifully crafted doors. The upward curves of tiled roofs and the enchanting calm of courtyards. Hanok, or traditional Korean houses, are delightful dwellings where those who enter them can't help but be hypnotized by their charm. 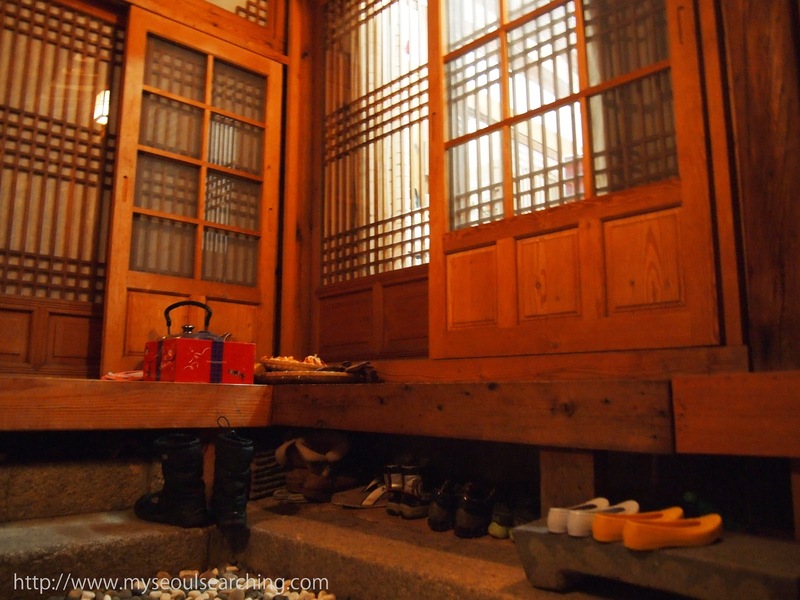 Constructed in accordance with nature and geographical location, hanoks were the preferred type of home by Koreans until last century. 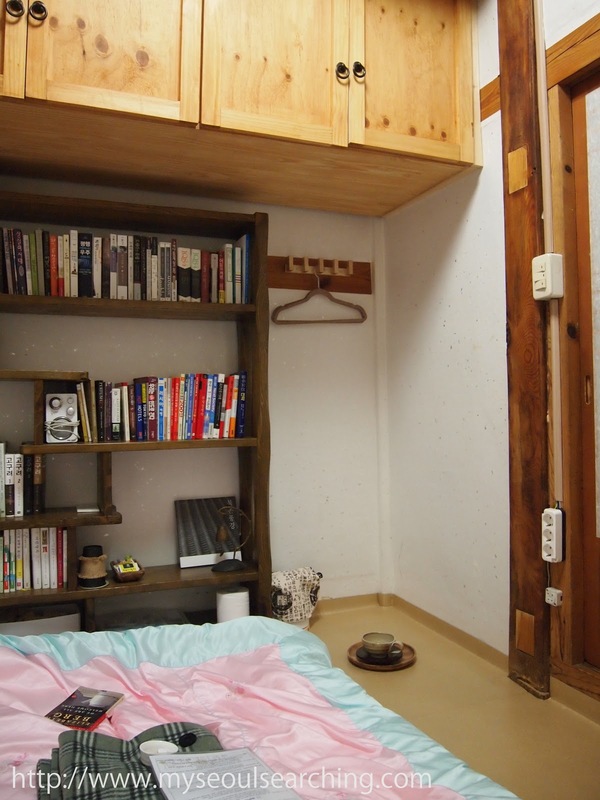 Due to population growth and lack of space, Koreans in bigger cities have since been forced to build upward and live in unattractive cement structures. This is especially true in Seoul, where residents prefer more modern homes with larger living spaces. 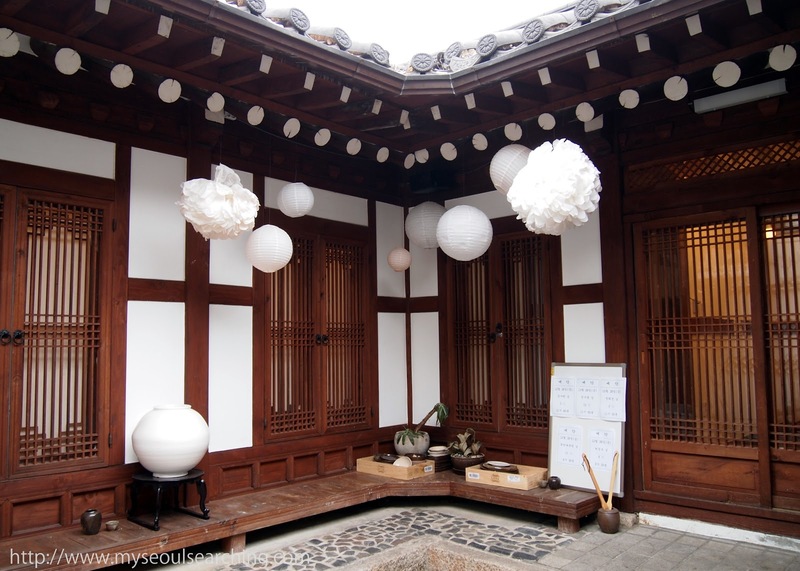 Still, there are a few places in the Korean capital where visitors can bask in the beauty of the hanok. 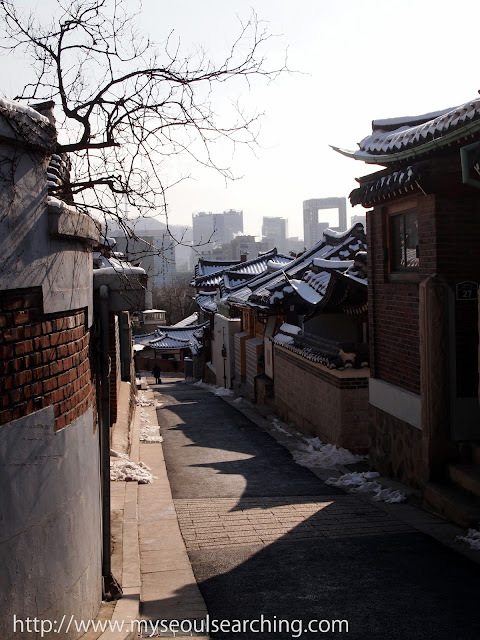 Bukchon Hanok Village is a neighborhood where old meets new; visitors can enjoy spectacular city views as well as traditional Korean architecture. Samcheongdong and Bukchon Hanok Village are adjacent neighborhoods in Jongro-gu, the central district of Seoul. The former is now a trendy area of boutiques, cafes, and restaurants, while the latter is a residential area popular with tourists. These areas are best known for the traditional architectural structures that delineate the alleys and streets that wind through them. Many of these buildings are homes but others have been renovated and turned into businesses. Although I've visited the areas on multiple occasions before, I decided it would be fun to have a bit of a "staycation" in the area during my winter break and blog about the hanok hideaways that I would happen upon. I arrived in Samcheongdong just around lunchtime and was eager to find delicious food, but let's face it, when am I not? 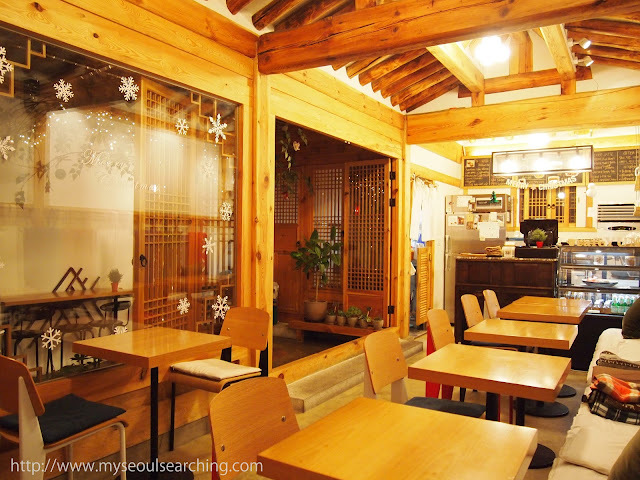 The neighborhood has a seemingly infinite number of eateries, and as tempted as I was to stop at many of them, I was determined to find a hanok. 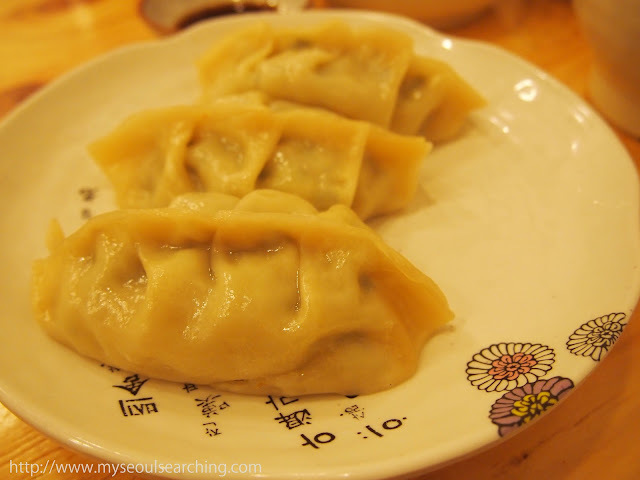 When I spotted one serving mandu just off the main drag, I knew I had to try it. Bukmakgol was a bit fancier than I had expected. I realized this soon after entering the onggi (kimchi and soy earthenware jar)-lined courtyard. The place was fairly empty and because of this, I was seated in my own private room. 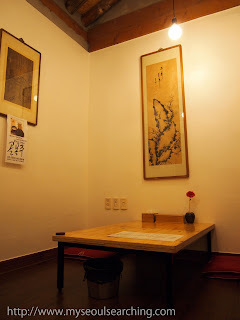 The interior was simple and Zen, decorated with only a few low tables, a couple ink paintings on the wall, and a single plant in the corner. Unfortunately for those who can't read Korean, there is no English menu available but a few of the staff seem to be able to speak enough of it to help out. I ordered kalguksu (knife-cut noodle soup; 8,000 won) and a plate of gochu mandu (chili dumplings; 5,000 won). Banchan (side dishes) was brought out first and I was excited to see all of my favorites placed in front of me: jeon (pancake), mul kimchi (cold kimchi soup), onions in a tasty sauce and cabbage kimchi which was heavily rubbed with red peppers, just the way I like it. I inhaled the dumplings, which were steamed to perfection and had just the right amount of spice. I also appreciated the privacy when my kalguksu (hand-cut noodles) was brought out, as I can be quite a slob when eating noodle soup with chopsticks. The soup was a bit bland at first, but tasted better when I added the accompanying chopped peppers. There was a nice chunk of fat that sat atop the noodles, which also gave the dish more flavor after a while. Bukmakgol was a great find and I left with a full stomach, ready to take on other hanoks. Visitors enter Bukmakgol through a nicely decorated courtyard. Kalguksu, or noodle soup, is a specialty at Bukmakgol in Samcheongdong. The gochu mandu (chili dumplings) were filling and delicious. After an hour of wandering up and down the hills of Samcheongdong's residential area, I was freezing and in desperate need of a hot drink. I entered Yeon Traveler's Hangout just before the frostbite set in and was pleased to have found such a pleasant establishment. The bright interior immediately caught my attention, as did the colorful nick-knacks and photos of far-off places arranged neatly throughout the main room. I then noticed a few other spots and rooms in the adjacent wings which seemed to be cozy crannies perfect for small groups. I grabbed a spot on one of the floor mats and took a look at the menu. I was intrigued by the interesting drinks served up at Yeon. Staying true to its travel concept, the cafe offers a variety of teas from around the world, as well as lassis, coffee beverages inspired by a number of countries, and even cocktails. The chili hot chocolate (7,000 won) sounded too good to pass up so I ordered a cup while I browsed an old travel guide. I was a bit disappointed by my drink, as it tasted like it could have been made from a Swiss Miss mix and I couldn't detect any spice. 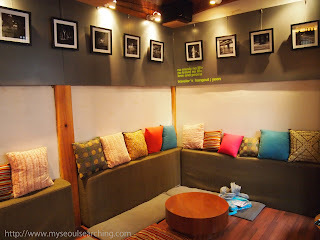 Still, Yeon was a cool place to hang out and read for a couple hours. Next time I'll try the teas. The atmosphere of Yeon Travelers Hangout is relaxed yet playful. 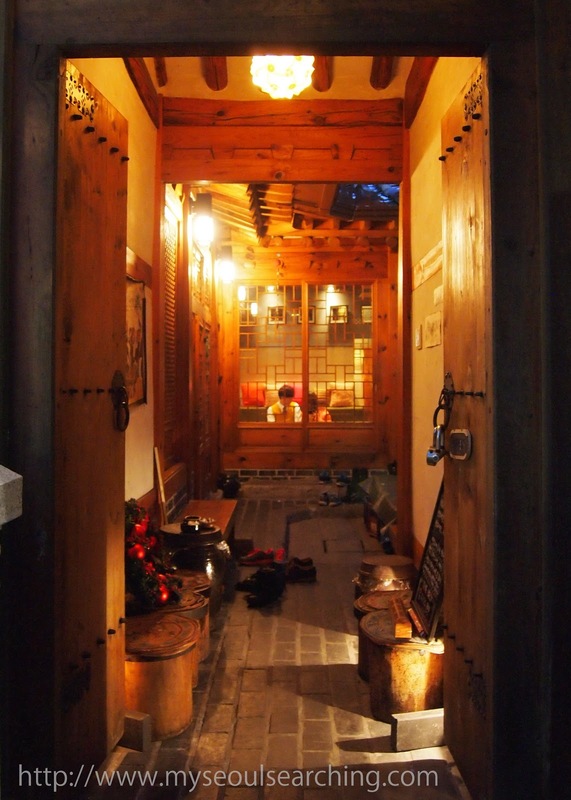 Customers pass through a traditional gate to get to the main room of Yeon's. 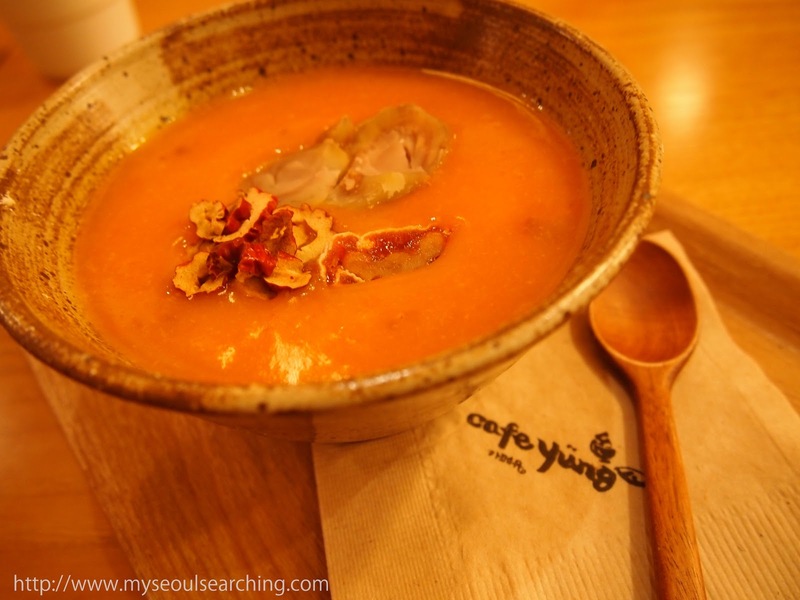 Still full from lunch, I opted for a light dinner and settled into Cafe Yung, a clean, comfortable cafe housed in a renovated hanok. The hobac juk (squash porridge; 8,000 won) was, in the words of Goldilocks, "just right" for the chilly weather. It took a while to come out, making me think that it was prepared fresh with a variety of nuts and herbs. It was rather small, and under normal circumstances, would probably not be large enough to be a meal, but it was fine since I wasn't too hungry. The cafe seems to be famous for recreating popular street foods with special twists. I was dying to try their hotteok (pancake stuffed with brown sugar and nuts) which, unlike the stuff on the street, is topped with blueberries. The persimmon frozen yogurt also looked divine. I regretted eating so much for lunch but decided I would be returning soon to get a taste of these treats. Cafe Yeon is the perfect place for dessert and tea. After dinner, I headed off to the Gye-dong area of Bukchon to check into Junkyu House, the guesthouse I would be staying in for the evening. 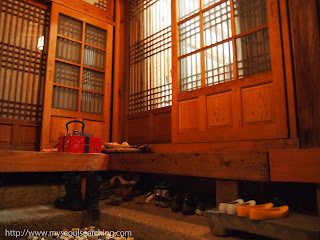 Some might call me crazy for booking a room so close to my apartment (a 10 minute taxi ride, to be exact) but I had really been wanting to experience staying in a hanok. When I found one on the BnBHero website for a mere $20/night, I had to book it. I was greeted by Ji-hyun, and her adorable six-year-old son, Jun-kyu upon my arrival. 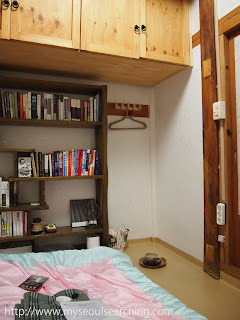 She showed me my small but cozy room, which was actually a wing of the house. 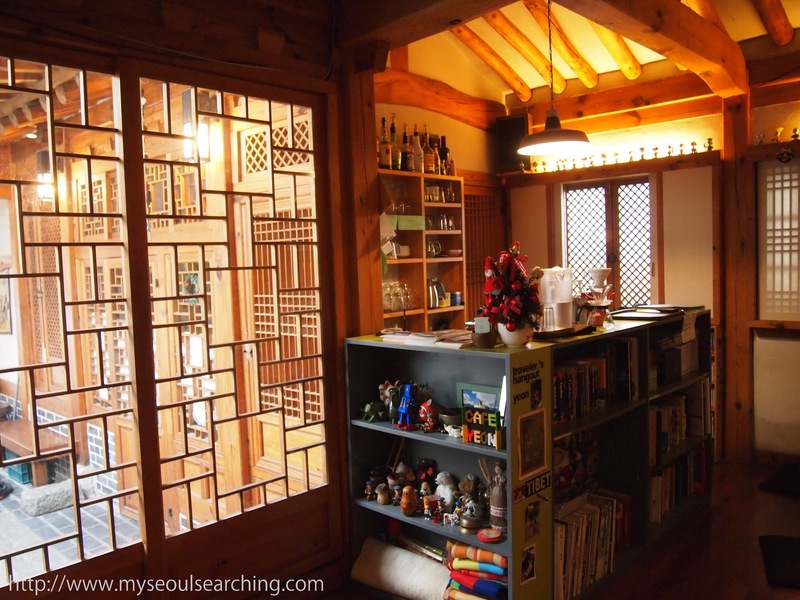 Everything about the room was perfect, from the carefully pasted mulberry hanji (handmade paper) on the walls to the hanok picture books displayed on the shelves. As I began settling in for the night, she quickly returned with a hot cup of yuja cha (citrus tea). 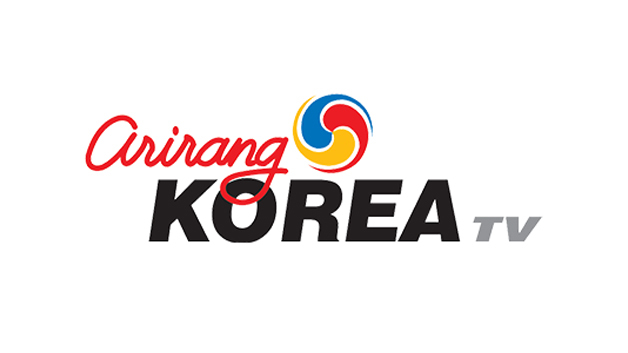 We began chatting about our past travels and our lives in Korea. 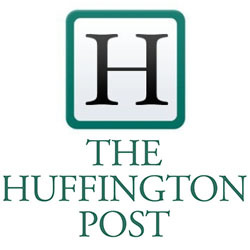 I asked why her family moved into a hanok when so many Koreans are intent on living in apartments. She told me that as architects, she and her husband were fond of traditional Korean architecture and the components that make up hanoks: the polished wood, a space to look up at the stars at night, and the environment that the home fosters to experience the changing seasons. Ji-hyun, her family, and her hanok were recently on an SBS segment that featured younger people who have given up their comfortable apartments for a more traditional home and lifestyle. They are a part of a movement in which younger generations are returning to their cultural roots in a country that has tried hard to force modernity and abandon old ways for the past six or so decades. 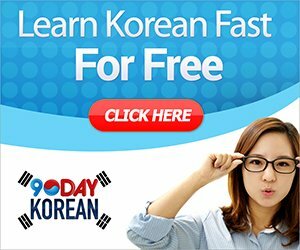 It's refreshing to see that so many younger Koreans are intent on preserving their culture and traditions. My stay was a nice one and I found it hard to pull myself up off the hot spot on the ondol heated floors the next morning. But, I had to, as my weekend of hanok-hopping was just about up. I braved the cold and took a final walk around the neighborhood before hopping a bus back home. One day, after I win the lottery, I plan on buying a hanok and spending my afternoons lazily sipping tea and reading books and contemplating life in its courtyard. 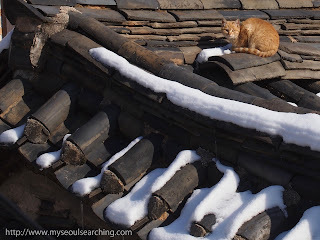 Until then, I'll continuing visiting Samcheongdong and Bukchon to daydream about that life in the hanok hideaways these fantastic neighborhoods have to offer. 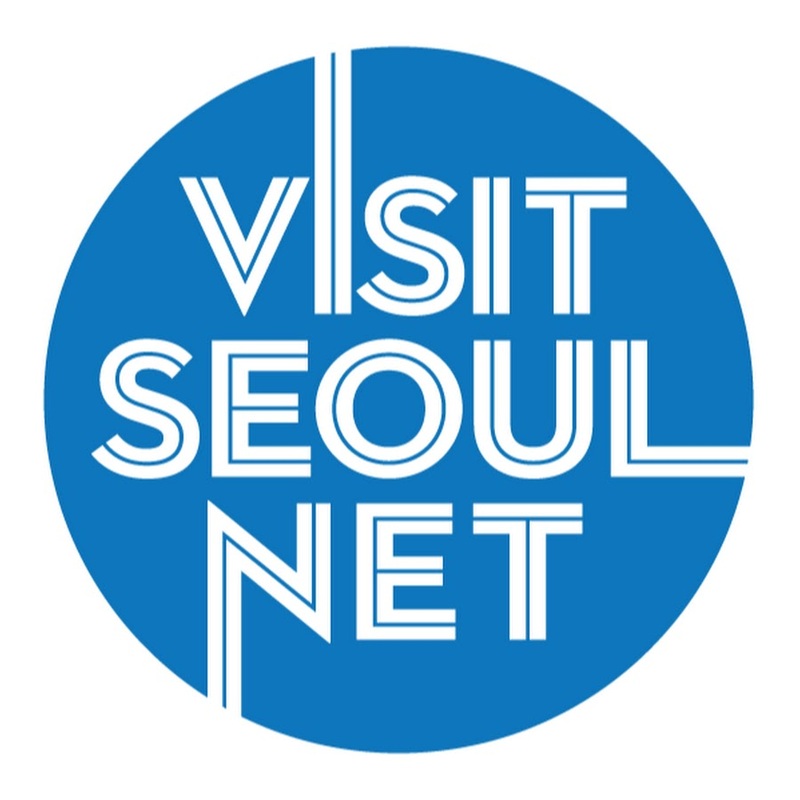 To get to Samcheongdong and Bukchon Hanok Village, take the Seoul subway to Anguk Station (Line 3, Exit 1). Go straight 100m and take a right onto the alley next to Pungmun Girl's High School. Continue straight along the road. Don't forget to pick up a map of the neighborhood at the information kiosk on the main road at the next major intersection. Note: This information was accurate at the time of publishing. Awesome pics. 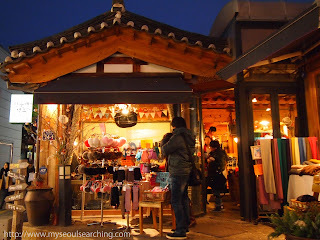 Samcheongdong is one of my absolute fave places in Seoul to hang out. We should do lunch sometime there! Sounds like a great 'stay-cation'. I really enjoyed Samcheongdong, that lunch with the kalguksu and dumplings was one of the best of the trip. Looks like a perfect staycation! Two of my favorite neighborhoods. I've been meaning to check of Yeon'! Jace, let's do it! Michael, those were the best dumplings I've had... EVER! Wanted to use that restaurant for this post but will another time. Amanda, def check out Yeon. Cool place. 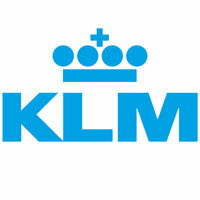 I've heard they serve cocktails at night, too. 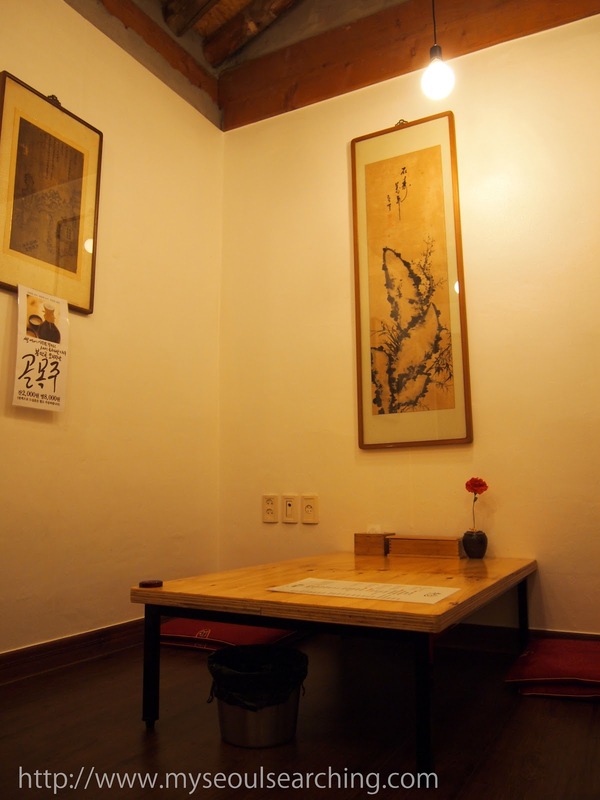 You may try to find a HanokStay at http://kozaza.com.